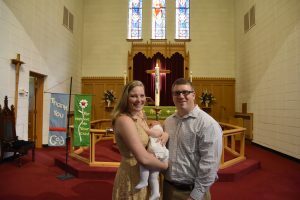 We welcome Iyla Elizabeth Alice Hansen on September 16, 2018, as a new member of St. Peter's through the waters of Holy Baptism. She is the daughter of Blake & Meghan Hansen. Her sponsors are Mollie Brady, Mark Brady, Susie Carman and Ashley Hansen. God's blessings to Iyla! 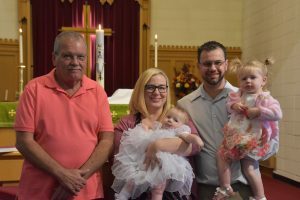 We welcome Paisley Jo Flood on September 23, 2018, as a new member of St. Peter's through the waters of Holy Baptism. She is the daughter of Kyle & Joell Flood. Her sponsors are Sally Soravia and David Soravia. God's blessings to Paisley! 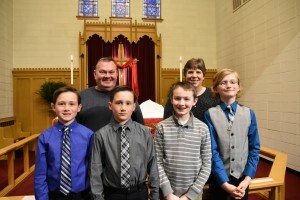 On Maundy Thursday, March 29th, Robert (“Bo”) Jorgenson, Jacob (“Jake”) Jorgenson, Braden Heacox and Avery Eastman received their First Communion. In this photo they are joined by Bill and Karen Thorson, their First Communion teachers. 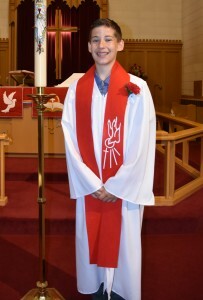 On Sunday, June 10, 2018, Kealand Sauser was welcomed as a Full Member into Church of Christ through the Rite of Confirmation. He is the son of Jen & Curt Sauser and was sponsored by Ralph Foss.